Fleshed out with brief, pithy nuggets of thought, idea jump-starters, or questions designed to spur the preacher's imagination. Two or three themes or streams of thought that are related to but separate from the primary theme offered. Including Gathering Prayer, Collect, Pastoral Prayer, Congregational Prayer, Responsive Reading, and a Closing Prayer or Benediction. The book identifies six different creative approaches to sermon planning. Each lens is explored in a 700-1000 word essay. These 700 word essays cover a variety of current and critical topics for the preacher--contributed by leading homileticians. The full text from six to twelve sermons will be included. Additional are available online. These sermons will highlight best practices, unique approaches, and fresh voices. This section will briefly outline and describe ideas for unique sermon series based on lectionary readings. 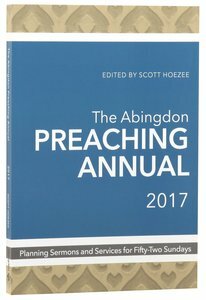 About "The Abingdon Preaching Annual 2017"
ScottHoezee is an ordained pastor in the Christian Reformed Church in North America. He serves as the first Director of the Center for Excellence in Preaching at Calvin Seminary. He has also been a member of the Pastor-Theologian Program sponsored by the Center of Theological Inquiry in Princeton, New Jersey, where he briefly served as pastor-in-residence. Hoezee is the author of several books and resides in Michigan with his wife and two children.